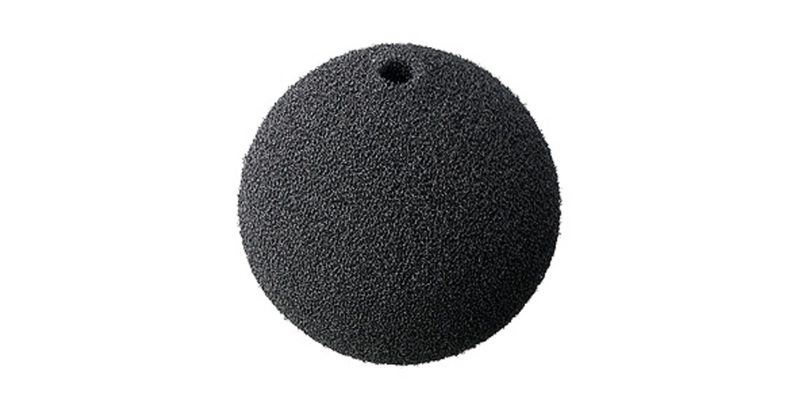 The AM0069 contains 5 spherical windscreens specially designed and optimized for use with 1/2" microphone sets for sound pressure measurements under free-field conditions, e.g. in situations where the wind comes from more and unpredictable directions. The windscreen is mounted by pushing it as far as possible over the microphone and preamplifier. When a microphone is placed in a laminar flow, turbulence is created which in turn results in unwanted pressure variations on the diaphragm. By using a windscreen these pressure variations are moved as far away from the diaphragm as possible. The GRAS windscreens are all size optimized and their special, open-cell foam structure and number of pores per inch2(ppi), are designed to resist a humid environment and at the same time not influence the sound pressure measurement result significantly. If the turbulence reduction is not sufficient for your type of measurement, we suggest the intensity measurement technique that suppresses background noise effectively. GRAS has a wide range of 2D, 3D and wide-frequency intensity probes supporting both CCP and LEMO input modules, see GRAS Intensity Probes . If you need to make sound pressure measurements in a well-defined laminar airflow, e.g. in a wind-tunnel, we suggest that you look for GRAS nosecones. Alternatively look for our surface microphones, our new flush-mounted microphone concept or our turbulence screen.